Suzie and Sally, absorbed in the film. This version of the animation is deeply special because of its faithfulness to Smith’s drawings. Suzie decided to keep the imagery closely based on the pictures that Smith added in the margins of her poems, adding colour to these black-and-white sketches only sparsely. In the poem, King Arthur’s world is blue, as he rides through a forest of vast cornflowers. But as Guinevere searches for him, calling his name, her world is cold and monochromatic. Suzie kept the scenes with Guinevere mainly black and white, with only occasional touches of colour, such as the flames in this image. But Suzie’s most inspired decision, I think, is to centre the animation on the figure of the typist. Smith’s working life as a secretary shaped her writing: Novel on Yellow Paper integrates the textures of a typist’s day into its physical form (typed out on the yellow paper available in an office), and the image of the secretary pops up again and again in her work. ‘Childe Rolandine’, for instance, describes an anguished secretary-typist protesting her own oppression. 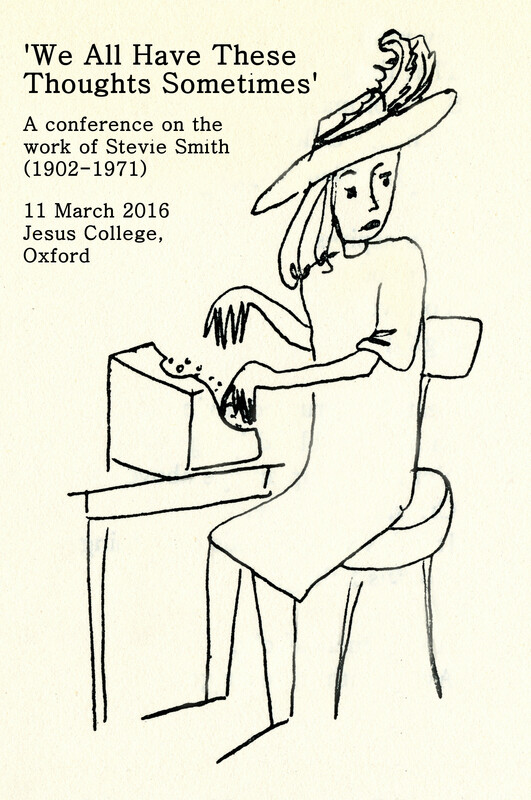 Stevie Smith accompanied that poem with a picture of a typist in a marvellous feathered hat, which you can see here. And over it all is Phil Archer ’s superb soundtrack. Listen carefully, and you can hear the rattle of the typewriter transform into the sound of horses’ hooves; the tinkle of chime bells and xylophones, carefully chosen to mimic the improvisational sounds of a primary school nativity play. But you’ll have to wait until the film is released in January next year. I can’t wait to share the whole thing.